This is a great opportunity to meet with your peers to discuss the latest trends, best practices, and technology! 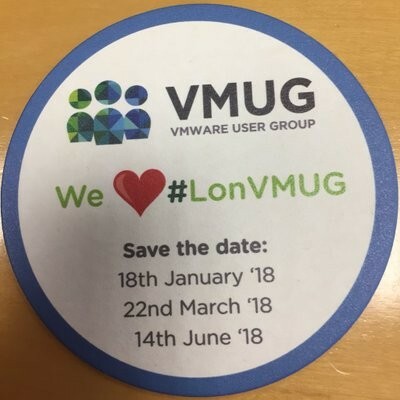 You'll find all the latest updates from VMware and VMUG, sessions from our sponsors and great community content too. If three busy rooms across the whole day is not enough for you, then please join us for further conversation and networking opportunities at our follow-on vBeers. Please also join the UK-London Community to connect with other members and stay informed for upcoming meetings. We're fully loaded with community content for this meeting! Dean Lewis - vSphere 5.5, the end (of support) is nigh. vSphere 6.5 is calling. vSphere 5.5 is end of support September 2018. VMware recommends you upgrade to the latest and greatest 6.5. So lets discuss migration strategies, preperation, and why upgrading is so great! Yes unfortunately you are going to lose the C# client, so you might as well do it sooner rather than later! In this session Christopher Lewis, Lead Consultant at Xtravirt, will be sharing his recent experiences in a designing a VMware vSAN infrastructure. Starting with a lightning introduction to VMware vSAN, he will swiftly move onto vSAN design topics where he will cover some of the decisions that help to shape the vSAN design. Finally, he’ll close the session with some key points and gotcha’s to keep in mind when designing a VMware vSAN architecture. The wearing of spandex and a cape, whilst encouraged, is not required to attend this session. Kev Johnson - What the hell is GDPR (and why should I care)? In which a sleepy, kind-hearted northerner descends from the Northern Powershouse to lecture folks in the business of what GDPR means, through the medium of cat photos and interpretive dance. Minimum jargon, may include puns. Speaker may not be an expert on anything. Audience particiaption greatly received. Kev is Senior Systems Architect at Software Box Ltd and co-host of the OpenTechCast podcast. He will be setting off at 5am to be here, be gentle with him. Darren Mears - Why SDN's true power is policy - An NSX story. In this presentation I will explore the roles of Network Function Virtualization and Software Defined Networking as related to NSX. The journey takes us through the deployment of a private hosting platform with NSX at the core of it all. Why it was chosen, what was expected of it and ultimately what the end product is. The journey leads us to the exploration of policy as truth, and how without one truth the SDN/NFV era just makes it easier to make a mess of your network. We then take this concept of one truth further in a revisit of NSX as we look at the benefits of being platform agnostic and policy driven in our designs prior to deployment. Adam Bohle (VMware Cloud Specialist) on VMware Cloud on AWS, as the London region is now avaialble! We graciously thank our Gold sponsor Rubrik and our Silver sponsors Apstra and Quest for their support of London VMUG. Rubrik brings an API-fueled, policy-driven platform to the traditional, dare we say stagnant, world of data management. As enterprise environments become increasingly driven towards the cloud, being able to control data at a global scale using declarative policies will help enable applications spanning multiple cloud platforms. We will demo automation of backup and recovery, backup validation, and our integration with cloud management platforms. The apstra AOS 2.1 product provides a new approach to network management, focusing on the system as a whole rather than individual components. A network infrastructure should be defined by the outcomes the whole system produces - which we call Intent. Join this session for a product overview and a demonstration.